If you are someone who enjoys mint + chocolate + cookies + more chocolate + more mint…. 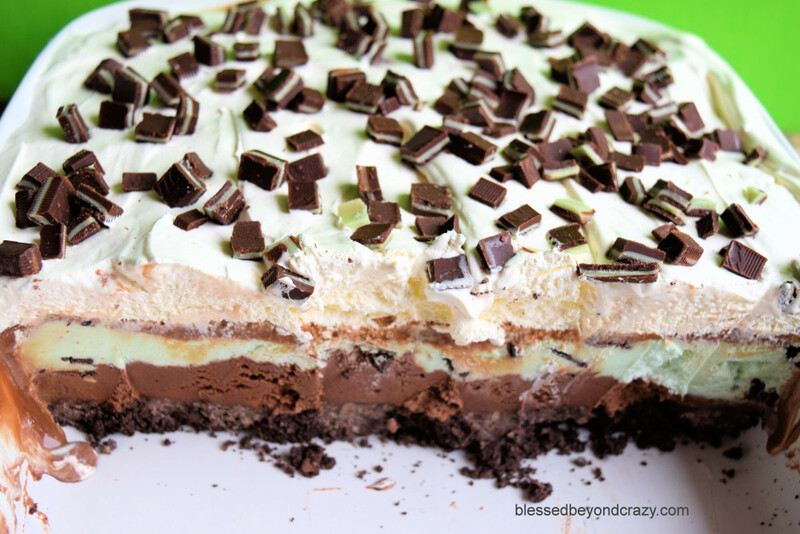 well, you are going to love this Frozen Mint Chip Chocolate Dessert! This recipe is a mint chocolate lover’s dream! Yep, and you can also make it gluten-free, so it’s a definite win-win! The recipe starts with a bottom crust made from crushed mint cookies. Next, the crushed cookie layer is topped with a layer of softened chocolate ice cream, then another layer of softened mint chip ice cream. Next comes a layer of hot fudge sauce and a final layer of freshly whipped cream; garnish with chopped Andes Chocolate Candies. It’s always fun to serve delicious desserts on pretty dessert plates, so I borrowed pretty vintage dessert plates from my mother. I think the green color in the glass plates goes splendidly with the colors of this dessert! Crush cookies in a food processor. Combine cookie crumbs and butter. Press into a lightly greased 13" by 9" baking dish. Freeze for 30 minutes. Spread softened chocolate ice cream over crust and freeze until firm (about 30 minutes). Spread softened mint chip ice cream over crust and freeze until firm (about another 30 minutes). Drizzle chocolate sauce over top of ice cream. Whip heavy cream until stiff peaks form; spread on top of frozen dessert. Garnish with chopped Andes Chocolate Mint candies. Freeze until firm, or overnight. When ready to serve, remove from freezer and allow to set for 5 minutes. This dessert makes enough for a crowd so it’s perfect to serve at a party or for the holidays. (Think Patrick’s Day!) For smaller parties or gatherings, feel free to divide the recipe in half. What’s your favorite minty dessert?